nt, in the Gospel of John, of the blind man that Jesus healed. Jesus did so by spitting on the ground and creating a daub of mud, which he spread across the blind man’s eyes. Then Jesus instructed him to walk to Siloam and wash, after which he could see. Though Lucado did not mention it, that is where the term, “Here’s mud in your eye” evolved. Lucado also mentioned first acquiring glasses as a near-sighted fifth grader, and how the transformation in his vision was life-changing. I can relate, since I was the same age when my parents figured out I was terribly myopic. Like Lucado, until I went to the optometrist, was examined, and then returned a few weeks later to get my glasses, the world was a blur. I started playing baseball at age six. Since Allenstown, N.H. had only 1,800 residents in the early 1960s, our baseball team, called the VFW Little Leaguers, was comprised of kids my age on up to 12 or so. A team picture published in the Concord Monitor shows a group of kids perched on a bleacher. I am a full head shorter than everyone else in the photo, and am clearly — or not so clearly — squinting at the camera. There was no requirement that the coach play every ball player at least once every few games, as most organized leagues do now at that level. So it required my father’s intervention with the coach, as the season was winding to a close, for me to at last get one at-bat. I entered the batter’s box in the last game of the season, hugging the plate since my bat was so short. A pitch or two went by, in my memory, thrown by a pitcher considerably older — and taller — than me. As I hunkered down, another blur came toward me and plunked me in the side. It hurt a bit, but I was thrilled as I trotted down to first base. I managed to make it to second base before the game — and the season — ended. For the past few weeks I have been going through old files and photos saved from my years in N.H. for a possible long-term project. My mother saved everything and then gave it to me during a late-in-life attic cleaning. 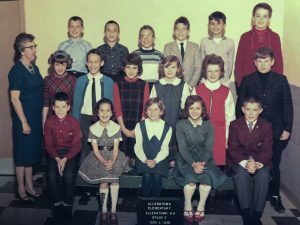 In the Allenstown Elementary class photos — the entire grade ranging size from 13-18 kids — I am the short boy each year squinting at the camera. That is, until the fifth-grade group photo, in which I am wearing horn-rim glasses. I was still short. I recall that autumn afternoon when I stepped out of the optometrist’s office in Concord and looked up at the trees along the sidewalk. Like Lucado, I thought, “Whoa! Those leaves are so bright and vibrant.” I looked across the street at one of the state buildings that lined the street of the capital, clearly seeing the outlines of its stone siding from 100 feet away. I once was (practically) blind but now could see. Lucado’s larger point was that we often have metaphorical mud in our eyes that prevents us from seeing, from growing in our faith. It is a point well-taken. I have been wearing glasses for well over a half-century now. As Lucado describes doing as a child, I still enjoy the sensation of taking them off and putting them back on, alternating from blurriness to sharp vision. I’m blessed with excellent eyesight, as long as I’m wearing glasses. Some folks still struggle even with specs. At night, when bedtime nears, I metaphorically put the world at bay by taking off my glasses. I enjoy that feeling.